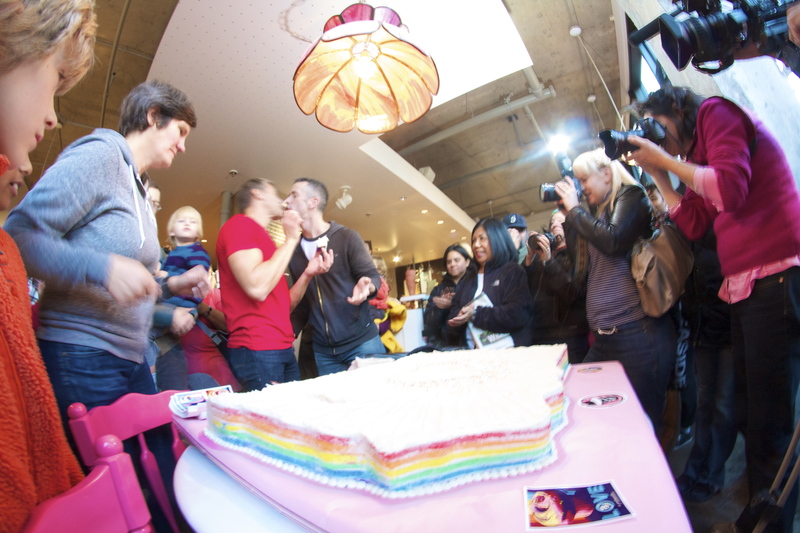 UPDATE: The crowd flowed out the door Friday afternoon to watch Dan Savage — and husband Terry Miller — along with Cupcake Royale’s Jody Hall — and her wife Kelly Ring — cut into a ceremonial giant rainbow cake in the shape of Washington State to celebrate the approval of R74. Savage talked about his joy in the referendum’s approval for marriage equality and also asked for a show of hands and a show of thanks for all the straight people who attended the cake party and supported R74. “We’re a tiny percentage of the population — gays and lesbians, bi and trans — we wouldn’t be making these advances without you,” Savage said. Has Savage already announced his engagement? He said Friday that he and Miller were planning their soon-to-be-legally recognized wedding. As Miller cut into the cake somewhere near Bellingham, a steady stream of attendees including dignitaries — Sally Clark and Jamie Pedersen — neighbors and lots of kids snapped phone pictures and grabbed a piece of cake. Related: The McKenna campaign has conceded the race for governor. Congratulations to governor-elect Jay Inslee. 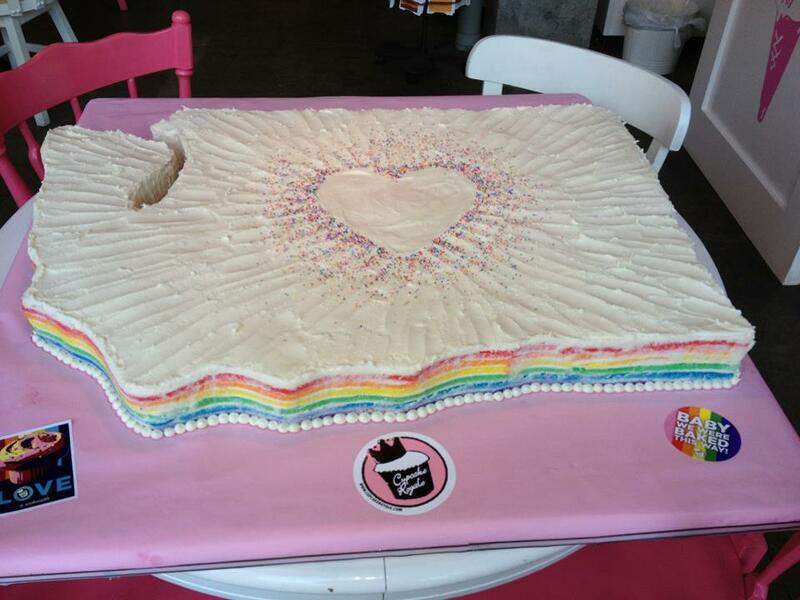 Original Report: Correction: The world’s biggest rainbow cake. Update: In the shape of Washington State. LET US EAT CAKE! Celebrate Ref 74 with us! IT IS A TIME FOR LOVE AND CELEBRATION! 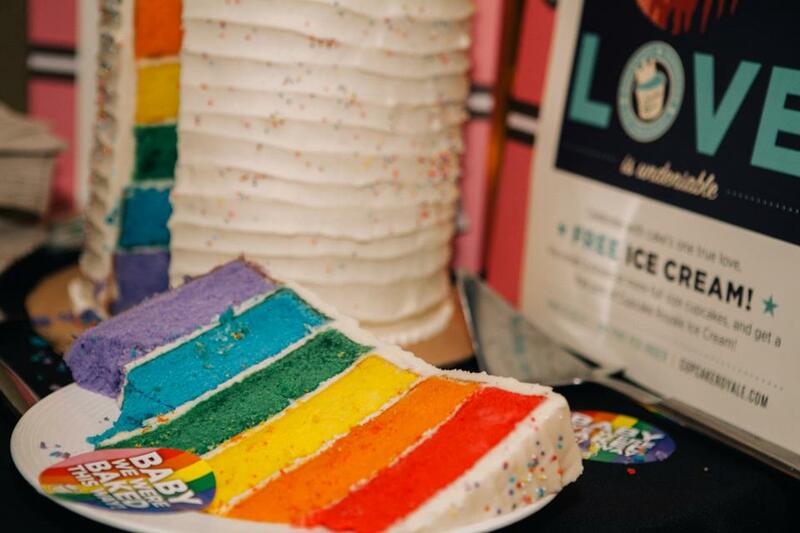 Join us at the CUPCAKE ROYALE IN CAPITOL HILL for a FREE slice of the World’s Biggest RAINBOW CAKE in the shape of Washington State! This is truly a cause for celebration and what better way to celebrate marriage equality than with the world’s largest gorgeous rainbow cake! Owner and Founder Jody Hall of Cupcake Royale would like to invite all in to the Capitol Hill bakeshop, 1111 East Pike Street, on Friday, November 9, 2012 at 3pm to enjoy a slice of cake, on the house, to commemorate this historic moment! I’m going to be at work until at least 4:30, I don’t want to miss out on a slice!!! Vegan, gluten-free, or anything else. 3 PM? Way to perpetuate the myth that Democrats don’t work, Cupcake Royale. ;) J/K. Looks like delicious, Sweet victory. Nice idea, but, not equal to the moment in size or the mood. Let them eat cake was not the theme of this election for the progressive side. And yes, I just got off work. Oh well. Jody and the cup cake empire were very supportive of Approve R-74 – that is all to her credit. Thanks. Wait… is it [the world’s biggest rainbow cake] in the shape of Washington state, or the world’s biggest [rainbow cake in the shape of Washington state]?